The electric car company that drove its loyal fans into a frenzy of anticipation usually associated with iPhones and Xboxes unveiled its new, lower-priced model Friday at an event in Southern California. Some of those fans had already put down deposits on Tesla Motors' Model 3 sedan before it was introduced Thursday night at the company's design studio in Hawthorne. The Model 3 doesn't go on sale until late 2017, but in the first 24 hours that order banks were open, Tesla said it had more than 115,000 reservations. By Friday evening, that number reached 232,000, according to the company. "Definitely going to need to rethink production planning," a surprised CEO Elon Musk said on his Twitter feed. Long lines at Tesla stores, reminiscent of the crowds at Apple stores for early models of the iPhone, were reported in California, Hong Kong to Austin, Texas and Washington, D.C. before the Model 3's glitzy unveiling Thursday night. Potential buyers put down a $1,000 deposit to reserve the car. At a starting price of $35,000 -- before federal and state government incentives -- the Model 3 is less than half the cost of Tesla's previous models. Tesla CEO Elon Musk says the car will go at least 215 miles when fully charged, about double what drivers get from current competitors in its price range, such as the Nissan Leaf and BMW i3. The Model 3 is the most serious test yet of 13-year-old Tesla's ability to go from a niche player to a full-fledged automaker. It could be the car that finally makes electrics mainstream -- or consumers could continue to be skeptical that electrics will work for everyday use. In the U.S., they still make up less than 1 percent of annual sales. 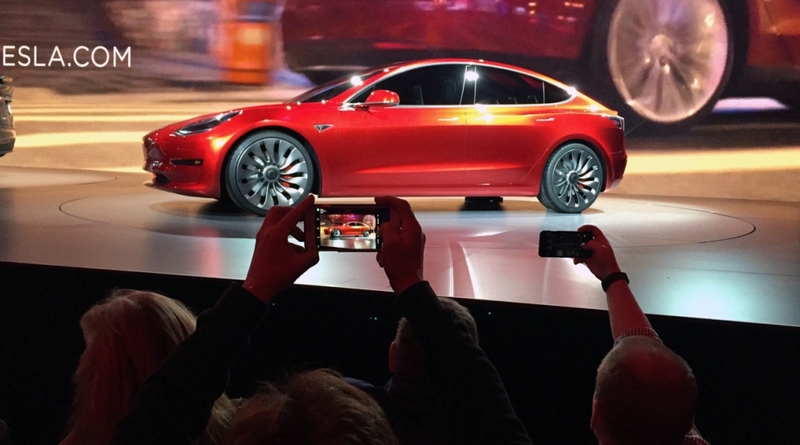 Either way, the Model 3 is already changing the industry, spurring competitors to speed development of electric cars and improve their battery range. The Model 3 puts Tesla within reach of millions more customers. Last year, only 2.1 percent of new cars purchased in the U.S. cost $75,000 or more, but 35 percent -- or 5.5 million -- cost $35,000 or more, according to TrueCar. The Model 3 is a critical part of the money-losing automaker's plan to increase sales from around 85,000 this year to 500,000 by 2020. Robin Santucci got the sixth spot in line when he arrived at the Santa Monica, California, Tesla store at 3:45 a.m. Thursday. By 9 a.m., he estimated there were 200 people in line. Santucci has admired Tesla for years. When he got his current car, an electric Fiat 500, he made sure the lease would run out at the end of 2017 so his next car could be the Model 3. Potential buyers also lined up overnight in Burbank. Tesla said that deposits are "fully refundable" and can be applied to the purchase of a Model S or X. "For me, personally, I just wanted to one of the first in line to get the tax credit," said Peter Peng, who was at the Burbank store Wednesday night. "To me, this is bigger than the iPhone, it's bigger than the X-Box. It's a car. Tesla is such an innovative company on the cusp of cutting edge technology. It's the first affordable car in its range." Campers cited a broad range of reasons for their dedication to a brand that has developed Apple-like loyalty. Some liked the unrivaled range. Others were attracted to the style, technology and performance. Shayan Keshmairn arrived at 4 a.m. The lower price and impressive EV range convinced him to get up early and visit the Burbank store. Then, there was Mike Nescovic from Serbia. "I am great Tesla fan, and for me this is patriotic duty," said Nescovic, wearing a jacket and stocking hat outside the Burbank store. "I'm from Serbia, and Nikola Tesla, scientist, was from Serbia." The company does not use a traditional dealer model to distribute and service its vehicles. The Burbank store is one of 11 from Laguna Niguel in Orange County to the San Fernando Valley. Campers also waited overnight at stores in the Bay Area.